At TPC Racing we strive to design and produce products for those who demand the best in performance from their Porsche vehicles. Using our vast knowledge and experience on and off the track, we have designed the TPC Racing Adjustable Thrust Arm Bushing Kit, for the driver looking to get the most out of their car. FIND THE PERFECT SETUP TPC Racing Adjustable Thrust Arm Bushing Kits are the perfect answer for both a street driven car, the occasional track day car, or for any full race effort. The TPC Racing Adjustable Aluminum Thrust Arm Bushings are designed to replace the factory rubber bushings, which cause unwanted caster changes under acceleration and deceleration. Elimination of these rubber bushings results in more precise and consistent handling on both the road and track. TPC Racing Adjustable Thrust Arm Bushings also allow for a wide range of caster adjustment. Because the vehicle's suspension geometry and rate change as you accelerate and decelerate, it is essential to have enough adjustability and rigidity on the suspension to combat any negative handling characteristics the vehicle may exhibit. TPC Racing Adjustable Thrust Arm Bushing Kits are the best solution whether you are trying to achieve the perfect race setup or just increase everyday drivability. TPC Racing Adjustable Thrust Arm Bushing Kits are made from 100% aircraft grade material. 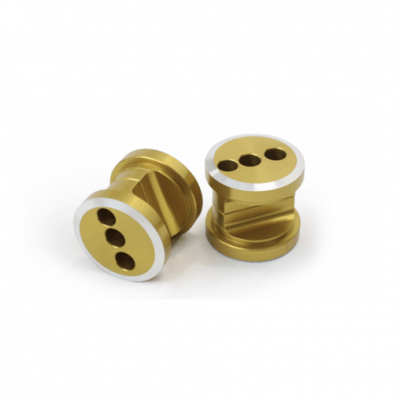 Also TPC Racing is one of the only sources to offer you with 2 different sizes of Adjustable Thrust Arm Bushings. Applications available for: Thicker Unit- -987 Boxster/Cayman/S Front Control Arm -997 06+ Front Control Arm Thinner Unit- -986 Boxster Front & Rear -996 Front & Rear -996/997 GT2/GT3/RS Front & Rear -997 06+ Rear -987 Boxster/Cayman/S Rear *Sold in sets of 2. One set required per axle.